EDITOR'S NOTE 7/25/14: We plan to update this story soon after reviewing the newest models. In the meantime, see our notes below for exceptional deals on the Samsung PN51F4500 and other Vizio options to consider. While it’s incredible how inexpensive a TV can be these days, the pickings at $500 or less get pretty slim. Sure, there’s plenty of product at that price, but none that gets glowing reviews. Picture quality tends to be compromised, and the feature sets are usually Spartan. After a lot of digging, we finally found a couple of TVs that are safe to recommend. One is a relatively large, 51-inch model with excellent picture quality. The other is a 42-inch model that includes Internet connectivity and smart TV features, both rarities in this price class. 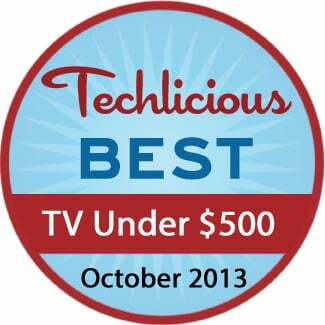 The best $500 TV? The Samsung PN51F4500, a 51-inch plasma TV that just barely limbos under our $500 bar by selling on Amazon for $497. 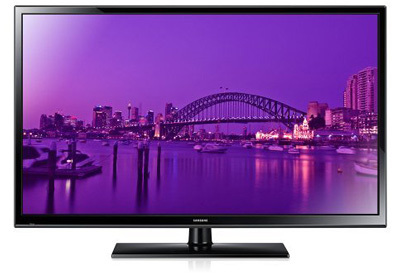 The PN51F4500 is 10 to 12 inches larger than most of the LCD TVs in this price range. With a 42-inch set at a normal viewing distance of 10 feet or so, you feel like you’re watching TV. With a 51-inch set at the same distance, the picture is more enveloping and more theatrical — not theatrical, just closer to theatrical. Base your Super Bowl party around the PN51F4500 and you’ll have enough picture to entertain a half-dozen people, easy. Experts agree that plasma TVs deliver a substantially better picture than all but the very best LCD TVs. You notice the difference immediately in the dark parts of the picture, where most plasmas deliver deeper, darker, more realistic blacks and dark grays than most LCD sets can. Plasma TVs also typically offer a wider viewing angle and don’t suffer from the motion lag that can cause distracting blur when you’re watching sports. The great-looking 51-inch picture is pretty much the only feature you get with the PN51F4500. The PN51F4500 is about as bare bones as TV sets get. It has only two HDMI inputs, which isn't enough for many people. Imagine you have a cable box and a Blu-ray player — where do you connect your game console? This TV also lacks Internet connectivity and smart TV features. Yes, you can add those functions from a Blu-ray player, a video game console or outboard boxes such as the Roku LT. But that may mean another box you have to hook up and another $50 you have to spend, and it definitely means another remote to deal with. EDITOR'S NOTE 7/25/14: The price on Amazon has changed since this review was written. Best Buy now has the PN514500 on sale $379.99. That's a fantastic price for this much TV. Most people focus on price and picture quality when choosing a TV. But the new generation of Internet-connected smart TVs has some viewers looking beyond the pretty picture. The E420i-AO LCD TV’s Vizio Internet Apps access numerous Internet streaming services including Netflix, Amazon Instant Video, Hulu Plus, Vudu, YouTube and Pandora. Wi-Fi is built in, so as long as you have a Wi-Fi network and broadband Internet, you can stream Internet video with no extra hookup required. For a smart TV, though, the Vizio E420i-AO is the way to go. EDITOR'S NOTE: 7/25/14: The new E400i-B2 is an updated model with a slightly smaller 40-inch screen and a much lower $398 price on Amazon. Interesting recommendations. The Vizio E Series is definitely a great choice for a decent quality TV at a great price, particularly if you’re looking for a smaller, secondary TV for a kitchen counter or office. 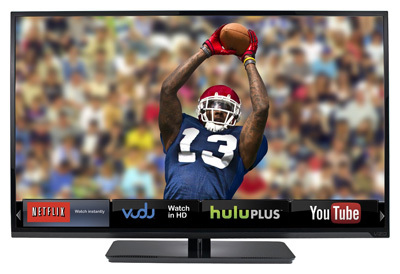 The E241i-A1 is only $200 and has 1080p vertical resolution with all the Vizio internet apps feature. The thing is… if you’re looking to get a permanent fixture for your entertainment center, you’re really going to want to go above 60 inches, and based of my research you really get the best bang for your buck in the $1000 - $2000 range, particularly with the Panasonic plasmas which dominate the top of Cnet.com’s charts. The investment will be well worth it.